One of the best horror movies of the 50s is without a doubt the 1958 version of “The Fly”, the story of a scientist who gets fused with a common fly when a experiment goes awfully wrong. Directed by Kurt Neumann and starring David Hedison and Vincent Price, “The Fly” went on to become an enormous hit thanks to its effective mix of mystery, suspense and horror. As usual, to the surprising success of “The Fly” followed the making of a sequel, “Return of the Fly”, released immediately the following year and with Price reprising his role. However, the change of focus from suspense to shock and horror, together with the rushed shooting and the low-budget made “Return of the Fly” an inferior product that did nothing but give a bad reputation to the series. This reputation extended to the third and final film, 1965’s “Curse of the Fly”, which is often labeled unfairly as “one of the bad sequels” when actually, it is a minor jewel of science fiction. 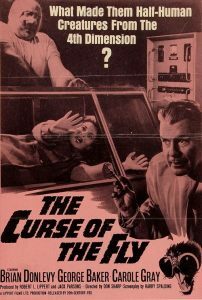 “Curse of the Fly” follows once again, Henri Delambre (Brian Donlevy), who despite having been almost destroyed by his father Teleportation machine in his youth, he has spent his life continuing his father’s work. Now he has his two sons working with him, and the Delambres have finally achieved transatlantic Teleportation, with Martin Delambre (George Baker) coordinating the Canadian side and Albert Delambre (Michael Graham) the British side. However, not everything is going well for the Delambres, as after a series of disastrous failures both Martin and Albert are disenchanted with the project and are willing to start a normal life. Henri’s experiments will become endangered once again when Martin marries Pat Stanley (Carole Gray), as the newly arrived bride has secrets of her own that could unleash the curse of the Delambres, the curse of the Fly. Writer Harry Spalding does a terrific job in bringing back the series to its original themes of mystery and suspense, and while he downplays horror in favor of sci-fi, the story carries an appropriate feeling of doom. Spalding’s script is very respectful of the themes exposed in George Langelaan’s original short story, and unlike “Return of the Fly”, it recaptures the Gothic atmosphere of the original movie and manages to tie in everything exposed in the previous films and give a proper conclusion to the Delambres’ saga. The addition of an element of madness to the story is really clever, and allowed director Don Sharp some chilling scenes. As the backbone of the movie, it is truly Spalding’s script what separates “Curse of the Fly” from other b-movies of its time, and returns the series to its former glory, at least for a last dance. Better known for his work with Hammer Studios, director Don Sharp took the job of bringing Spalding’s script to life while he was still at the top of his game. Already familiar with low-budget conditions of work, Sharp hides his monsters in the shadows and employs atmosphere and music to create the horrors of the Delambres’ house, and by doing this not only his monsters become more realistic and menacing, he also returns to the series’ roots by focusing the horror in the unknown and the unseen. Basil Emmott’s excellent cinematography is of great importance for this, as paired with Bert Shefter’s eerie score create an ominous atmosphere of dread that suits the Gothic style of the series to perfection. In many ways, “Curse of the Fly” feels like a science fiction version of those low-budget Hammer thrillers of the 60s like “Nightmare” or “Paranoiac”. Being produced in the United Kingdom, “Curse of the Fly” showcases a lot of British talent in its cast, which overall means a significant improvement over “Return of the Fly”. Brian Donlevy of “Quatermass” fame appears as the aging Henri Delambre, who despite all the tragedies he has lived insist in fulfilling his father’s dream. Donlevy’s performance as the tragic scientist is quite subtle, yet of great power. George Baker is for the most part effective, and even when at times appear a bit wooden he manages to carry the film without problems. As the troubled Pat Stanley, Carole Gray delivers probably the best performance of the film, giving a very natural performance in her role. The performances by the supporting cast are nothing special, but most make a good job with their roles. Burt Kwouk and Yvette Rees do have some quite good scenes as the Asian servants Tai and Wan. As often happens with sequels, low-budgets can really become the Achilles’ heel of a movie, and “Curse of the Fly” is no exception. While Don Sharp does a great job into hiding it during most of the movie, it is impossible not to notice that the make-up work in the movie is pretty bad and probably the worst thing in the film. Also due to budgetary constrains, the designs for the Teleportation machines look sadly poor and even anachronistic (they look like something out of a 50s film), cheapening some of the film’s best scenes. Still, thanks to the high quality of Spalding’s screenplay, most of those quibbles can be easily ignored as the film’s story is simply captivating. The masterful direction by Don Sharp also helps in this as for the most part he manages to disguise the movie’s flaws. Often dismissed as another cheesy horror from the 60s, “Curse of the Fly” is actually a fine piece of cinema that ultimately redeems the series in this the last chapter of the saga. One would have wished a better budget for this story, as the epic tragedy of “The Fly” is ended in an amazing fashion here. However, Don Sharp really made wonders with what he got (a true trademark of a Hammer alumni) and delivered a product worth of praise. While of course not as good as Neumann’s classic, “Curse of the Fly” is definitely an unfairly hidden gem of science fiction.